White, Window Bakery Boxes, 27" x 19" x 3"
Dimensions: 27-1/2" x 19" x 3"
Kraft, Window Bakery Boxes, 19" x 14" x 4"
Dimensions: 19" x 14" x 4"
White, Window Bakery Boxes, 10" x 10" x 2"
White, Window Bakery Boxes, 19" x 14" x 4"
Kraft, Window Bakery Boxes, 14" x 10" x 4"
Kraft, Window Bakery Boxes, 10" x 10" x 2"
Kraft, Window Bakery Boxes, 10" x 8" x 4"
Dimensions: 10" x 8" x 4"
Kraft, Window Bakery Boxes, 10" x 10" x 5"
Kraft, Window Bakery Boxes, 6" x 6" x 3"
Kraft, Window Bakery Boxes, 8" x 8" x 4"
White, Window Bakery Boxes, 10" x 8" x 4"
White, Window Bakery Boxes, 10" x 10" x 5"
White, Window Bakery Boxes, 6" x 6" x 3"
Kraft, Window Bakery Boxes, 8" x 6" x 2"
Dimensions: 8" x 5-3/4" x 2-1/2"
White, Window Bakery Boxes, 8" x 8" x 4"
White, Window Bakery Boxes, 8" x 6" x 2"
Kraft, Window Bakery Boxes, 9" x 9" x 4"
Kraft, Window Bakery Boxes, 12" x 12" x 5"
Kraft, Window Bakery Boxes, 8" x 8" x 2"
Dimensions: 8" x 8" x 2-1/2"
White, Window Bakery Boxes, 14" x 10" x 4"
Window Bakery Boxes come in many sizes and can be used for many things. Here at American Retail Supply we offer 20+ Window bakery boxes. With such are large variety, you're sure to find exactly what you need! 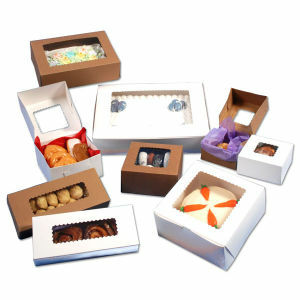 Bakery Boxes can be used for pastry's, cupcakes, pies, cake and more. With so many choices the possibilities are endless. Window Bakery Boxes can be white or kraft. These feature a clear window for showing off your delicious goods. They also have a scalloped edge on the window for extra decoration. This makes the window bakery boxes more appealing. Some window bakery boxes have glued corners and others have lock corners. Glued corners means the corners are glued together for extra support. Lock corners means the corners lock together. These corners have a slit on one side and a tab on the other. When you place the tab in the slot it creates a locked corner.